Heidi successfully named this plant Cherimoya. I recently came across it in the "exotic" foods display at the Whole Foods. You can see it was on a pile of kiwi. I thought I was not familiar with the cherimoya until I started reading the Wikipedia article. The minute I saw a picture of the inside, I thought, "well that looks like a custard apple." 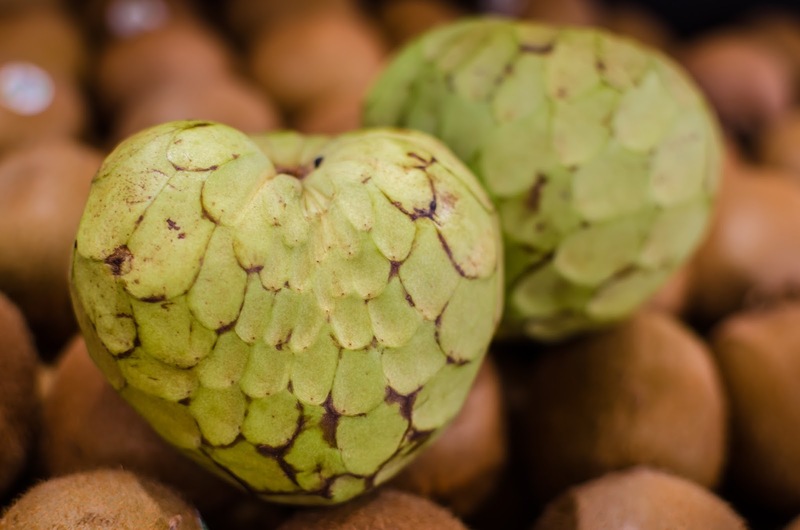 As it turns out, as I read down in the article, that is another name for the cherimoya. So I guess I was familiar with it. The cherimoya is mainly from Peru and Bolivia. This explains how Heidi is familiar with it, as she was a Peace Corps in both Bolivia and Peru I think. Fun fact: According to Wikipedia, Mark Twain considers it the most delicious fruit know to man.